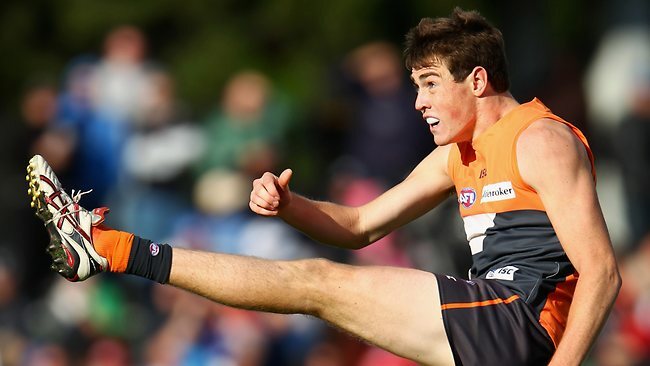 My Campaign For Jeremy Cameron: AFL NAB Rising Star. This is just a brief beginning to my campaign for ‘Jeremy Cameron: AFL NAB Rising Star‘ and this will not be last you hear of it. He is easily my favourite Giant, my favourite newbie and getting dangerously close to being my favourite AFL player, period. Which is why I’m devastated that he’s out for the rest of the season. He hurt his hip playing Port Adelaide in Round 19 (I was at that game!) and had surgery immediately afterwards. He’s out for the rest of the season, but he’ll be back for pre-season. Thank God. He is a great player – he’s got a great leg, he’s not scared of anything (at least he doesn’t act like it) and you should see the way this kid goes for the ball. It’s good on TV and even better in real life. I love it. He got the second NAB nomination this season, 16 games, 29 goals (leading GWS) and the love of a hard-to-win-over American? – not bad for such an unsuspecting player. Plus he’s had some great dream team scores which, as I’ve said before, the boyfriend makes sure I know EVERYTHING about. No one really expected this from him. Well… almost no one (because I did!). ← Dear AFL Assistant Coaches: I Can Help You.